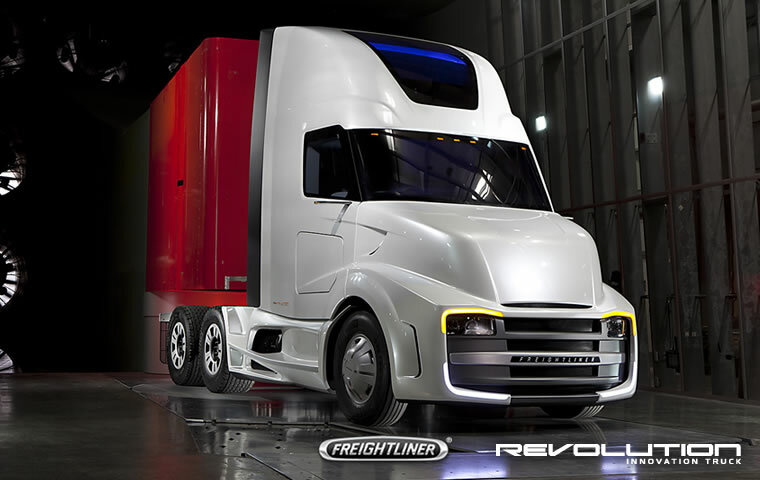 Daimler Trucks North America (DTNA) collaborated with Toray Carbon Fibers America to build the Freightliner Revolution Innovation Truck concept vehicle with special carbon fibers for exterior components. The Revolution Innovation Truck was unveiled at the 2012 Mid-America Trucking Show. Toray supplied carbon fiber pre-preg material that was used in the construction of the Revolution’s hood, roof cap, side walls and back wall, marking the first time this material has been used in heavy-duty truck construction. A special sandwich structure of low density honeycomb material and carbon fiber resulted in extremely lightweight components, which also simplified the truck’s inner support structure and maximized interior space. This resulted in significantly more interior space and functionality than a day cab, while weighing less than a sleeper. White LED headlamps use less power and have a longer life, making them a viable and attractive future technology for low- and high-beam forward lighting. Tinted reflectors, integrated into the front grille, make the lights "disappear" when they are turned off. Side-view cameras transmit a wide-angle view of the road into the cab via monitors mounted inside on the A-pillars. By replacing mirrors with cameras, it increases overall cab aerodynamics. Orange LEDs create a strikingly, highly visible turn signal in a unique shape above the headlamps. What you don’t notice is worth noticing: no visible door handles. For the sake of aerodynamics and convenience, the truck includes keyless entry via a key fob. All access points are opened by this remote system: the driver's door, the rear sliding door and the passenger-side baggage door. This asymmetric truck features a passenger-side wraparound windshield to reduce drag. Imagine being able to stand up and stretch in a day cab. Aerodynamic raised roof gives drivers an expansive interior while retaining the improved fuel economy of a day cab. A new concept in ingress/egress—a rear door—slides to the side with a push of a button on the key fob allowing drivers to more easily enter the cab. In addition, drivers can check their trailer connections without having to climb down from the vehicle, increasing uptime and driver comfort. Optimized for local and regional LTL applications, the Detroit DD13 stands out for its best-in-class fuel economy. The Detroit DTD 2100 automated manual transmission features an aluminum housing for less weight, state-of-the-art computer controls for fuel efficiency, and a wide range of time and fuel-saving technologies. Positioned mid-chassis with a side-air intake, the AC condenser doesn’t require high levels of outside air to operate. Electric fans cool at idle or slow speeds, preventing unnecessary use of the high-powered, less-efficient engine fan. The new Detroit long haul tandem rear axle delivers the fuel economy of a 6x2 with the safety and stability of a 6x4. By de-clutching the rear axle from the driveline at highway speeds, it acts as a tag axle, reducing friction and saving fuel. If a loss of traction is sensed, it immediately re-engages the rear axle to a standard 6x4 drive configuration.